The Super Bowl delighted viewers with a thrilling game, dancing sharks at halftime, and of course the marketing frenzy that gets as much attention as the game itself. Amid all the action, Ecuador made history by becoming the first foreign government to buy ad time during the game, paying a reported $3.8 million for the spot. 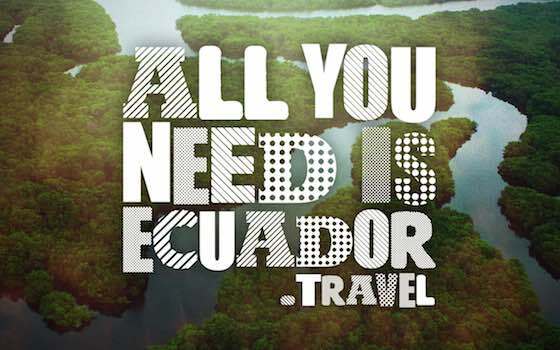 The #AllYouNeedIsEcuador commercial is part of an ongoing campaign by the South American nation to boost tourism. To the tune of the Beatles' “All You Need Is Love,” viewers were treated to scenes of Ecuador's natural beauty and incredible diversity. Environmental activists saw a chance to add their own message to the mix while #AllYouNeedIsEcuador was trending. Some wondered where the tourists would go given the government's willingness to approve oil drilling and mining projects in the Amazon. “Where will tourists visit if rainforest destroyed? #KeeptheOilintheGround” wrote the rainforest protection group Amazon Watch. The group aimed to stir a counter message on social media. “Just as the Ecuadorian government saw this as an opportunity to promote tourism, we used the opportunity to bring awareness to the call to Keep the Oil in the Ground in the Amazon and invest in community managed forest protection, including eco-tourism,” said Executive Director Leila Salazar-López. Yasuní National Park is a particular flash point. Last May, President Rafael Correa gave the go-ahead for the state-run oil company, Petroamazonas, to begin developing an oil-drilling project in the eastern part of the park. “Visit #Yasuni #Ecuador, most biodiverse place on Earth, B4 2 late!” said a tweet from Amazon Watch after the Super Bowl ad. The populist president has laid out a series of ambitious social programs to decrease poverty, but his government lacks the money to pay for it. The country is also deeply in debt to China. So the president is in a bind. Despite including the “Rights of Nature” in the 2008 constitution, Correa has shown himself willing to back off of environmental protection in favor of extractive industry projects. Some 20 percent of the country's oil reserves lie beneath Yasuní, and oil profits would go a long way towards paying for Correa's reforms. Developing the nature reserve, however, is not worth the environmental cost. The national park is one of the most biodiverse places on the planet. Scientists found that just one hectare of the park contains more species of trees and wildlife than are found in all of the United States and Canada. YASunidos, a group dedicated to protecting the national park, sent a petition to the government calling for a national referendum on the issue. The government rejected it, saying that fewer than half of the approximately 800,000 signatures were valid -- not enough to meet the 583,323 signatures needed for a referendum. Putting the drilling in the hands of the state-run oil company has environmentalists especially worried. Petroamazonas reportedly has a poor environmental record. In a recent article for The Nation, NYU Professor Andrew Ross wrote that he observed environmental contamination caused by the state-run company using the same cost-cutting practices as Texaco/Chevron. Chevron and Ecuador are locked in a much publicized international legal battle over Chevron's liability for rainforest destruction. The improper disposal of waste causes lasting damage to large swaths of forest, and chemicals seeping into the soil and groundwater can cause health complications to nearby inhabitants. The Mirador copper and gold open-pit mine is one such heavily contested project. Formerly Canadian-owned, the project is now co-owned by a Chinese company and the state. Indigenous Shuar and environmental groups are strongly against the mine because of the environmental destruction it will bring. The stakes are high. In December, Shuar leader José Tendetza was murdered. Human rights groups allege his death was linked to his opposition to the mine. The fight for the environment is an uphill battle. The government is steadfast in its desire to fund social programs through resource exploitation, and Correa is not one to take criticism lightly. He gained more media attention than the commercial for lashing out at social media users for creating satirical memes using his image. The #AllYouNeedIsEcuador campaign has many Americans excited to travel to the small nation. A significant boost in tourism could indeed provide some relief for the Ecuadorian government, especially at a time when falling oil prices makes it clear that relying on resource extraction is not a sustainable plan. Activists hope that increased attention to the threats facing Ecuador's invaluable ecosystems will inform North Americans and others what's at stake before visiting the country. It might be that all you need is Ecuador, but Ecuador's threatened ecosystems -- and the people who rely on them -- need much more than just love. "Ecuador: All You Need Is Love and Oil?"